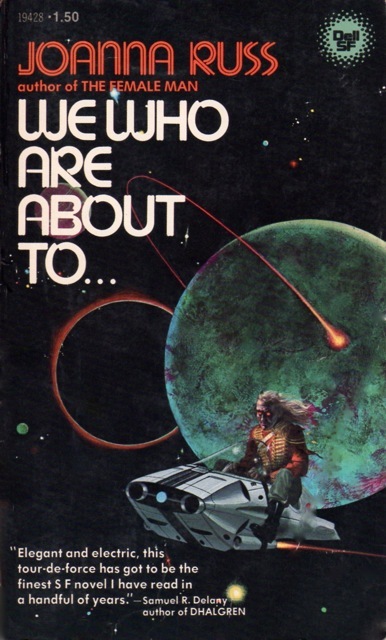 WE WHO ARE ABOUT TO… – Joanna Russ (1975) | Weighing a pig doesn't fatten it. After finishing a book, I usually read up on other reviews and stuff before starting my own. There’s no use in repeating what others already have written. When I came across a review by L. Timmel Duchamp – an SF author herself – published in the February 2006 issue of the New York Review of Science Fiction, it quickly dawned on me it was no use of even starting the review I had in mind, as her text said about everything I wanted to say – references to Robinson Crusoe included – but better. It also opened up my understanding of the novel. Not that I had totally missed one of the political messages of the book, but I hadn’t perceived its full importance. As I read it, the soliloquy not only allows the narrator to put herself–once a “Neochristian”–on trial for murder, but also explores enough of her history to make it possible for the reader to understand her series of responses to the situation following the crash. Through the soliloquy we discover that the narrator’s despair is not so much existential as political in the most fundamental sense of the word. At the time of the crash, the narrator was in full flight from a life of political activism and idealism that had smashed on the rocks of discursive politics. As part of a burgeoning movement of dissent, she learned the painful lesson of who may speak in a polis controlled by vast political and financial machinery (which these days we generally name “gobal capitalism”). The main gist of what I wanted to say is that We Who Are About To… is a lot more than a feminist novel. Framing the novel only as such – an easy mistake as Russ is the author of the better know The Female Man, and maybe even more importantly as identity politics is important in today’s discourse on culture – does the novel tremendous disservice. Not that its feminist stance is not important, on the contrary, and well-done at that. But I’ll refrain from elaborating further, and urge you to read the entirety of Duchamp’s take – if you’ve read the book already that is, as the first experience of this book suffers badly if you’ve had too many spoilers. If you want a quick intro on the plot, here’s Joachim Boaz’s glowing review. What’s left for me to say? I thought maybe of writing a text on how the unnamed protagonist of this book is a kind of opposite to the childbearing character in Children Of Men, but it’s been ages since I’ve seen the movie, and I haven’t read the book by P.D. James. More importantly, doing so would also focus on the feminist side of the novel, and that wouldn’t be in sync with what I wrote above. For that same reason I’ll refrain from elaborate comparisons to The Handmaid’s Tale, a book that’s about forced pregnancies as well. Atwood’s book is 10 years younger, but it’s a lot less radical in conception. More importantly: as a social analysis, it is also a lot less believable, as I wrote in my review. But again, ages since I’ve read that book, and this is no comparative literature blog to begin with, so a reference like this will suffice. What’s maybe left underdeveloped in Duchamp’s text, is the existential, philosophical aspect of We Who Are About To… Not that I have a lot to say about that either, just that at certain times the main character seems to live out her life simply being – and explicitly referring to Eastern modes of thinking: acceptance, the works, including Tao – yes, Tao, again. I think it’s one of the important themes in the book, and I could quote a few bits here and there, but ultimately it would be like reading rehash of stuff you’ve already read on all those millennial lifestyle blogs – I know they didn’t exist yet in the 1970ies, but hey, what kind of reader of speculative literature would you be if you’d object to a bad time-travel paradox? There’s one final thing I want to highlight, and that’s Russ’ visionary power. Certain aspects of male chauvinist psychology are brilliantly evoked in the following passage, and without a lot of words Russ nails a part of the reason why movements opposing the importance of identity politics have gained so much traction recently. I guess I’m only left with a quick assessment. The prose is snappy & confident. Russ shows keen psychological insight more than a few times. As far as plot and structure goes her choices are awesome: this book is not what you think it will be when you start reading it with only the feminist-planet-crash blurb in mind. Russ made some radical decisions, and it’s best those aren’t spoiled. In short: We Are About To… is a brave book, not an easy, generic read. It’s definitely recommended for fans of vintage scifi that do not mind their stuff a bit different. There’s not one cover that does this book justice. If you look at the entries in the ISFDB you’ll notice the first edition cover is a total fraud. The alien depicted is not even a character in the book. 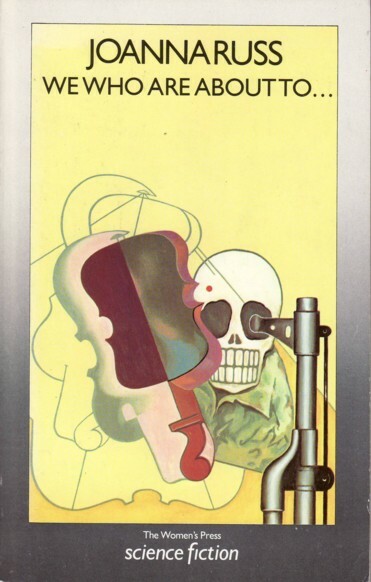 The ’87 cover is much too highbrow, as if this book has no pulpy side to it. It also overstates the importance of music in the story. The 2005 Wesleyan UP cover says nothing at all, and the 2016 image is similarly both expressionless and too highbrow. The fierce and at the same time carnal cover of 1978 I picked might not correspond to today’s tastes & sensibilities, it expresses its content best, as well as its historical context. This entry was posted in Reviews and tagged 1970s, Joanna Russ, Review, Science Fiction, We Who ARe About To.... Bookmark the permalink. I have the “alien on his way to an Ozzie concert” cover from the first edition. 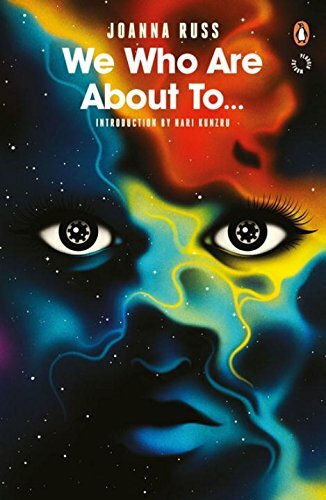 Russ might be one of those female SF authors doomed to have terrible cover art for many (if not all) her books, like Marta Randall. If anything, it is a testament to the odd fit that Russ’ feminist story made in the business of SF publishing. I too have a very high regard for this book. Somebody can point at it and say “That’s a feminist novel. That’s what feminism was,” and that would be a useful statement: the last few weeks have been terrible for feminism in entertainment, given the conspiracy of silence that’s been hiding all of the sexual crimes in move-making, comedy, etc. But Russ’ work is, as a character study, deeper than that, deeper than politics. Your description of that cover made me laugh out loud. I have the same edition btw. Will have to check on Marta Randall btw, a new name for me, thanks! I have read the PD James, by the way, and it’s very different from the film (though I only saw the second half of that). Worth a read, I’d say. On my to be read list. Have you read The Female Man? Or another of her titles? I’m doubting if I should read more Russ. Female Man yes – very good, I thought. I think worth a try. Thanks! I haven’t read TFM, so I can’t give you any advice on that question. In his review, Joachim writes he feels WWAAT is superior to TFM. Wonderful review! 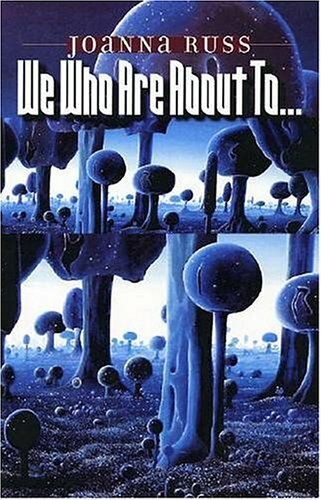 I read ‘We Who Are About To…’ a few years back and I don’t think my emotional reaction to the book and my review did justice to the book. Your review is quite insightful and makes me think. I think it is time for me to read the book again. On the cover, I have the first edition. I always wondered what is the connection between that cover and the story 🙂 Out of all the covers, I love the newest one the most, though I agree with you that it looks highbrow. Thanks for this beautiful review! Thanks for that comment! I’m glad you enjoyed the review!